When it comes to snacks for Children it can be a little hard to know what to give them. want to give them something a little different. We always offer Blake fruit and veg even though he doesn't always eat it. 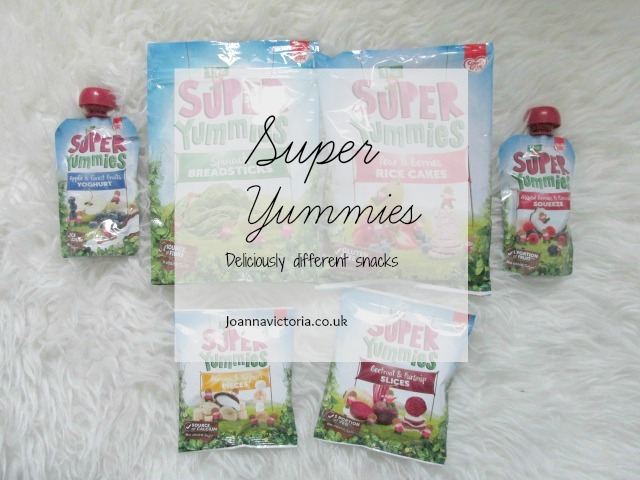 The snacks all come in a fab range of flavor combinations that your toddler will love. The snacks only have naturally occurring salt and sugar, making the range great for parents and their little one. I was sent a selection of the Super Yummies range for Blake to try. The range is suitable for children of 12 months and over. 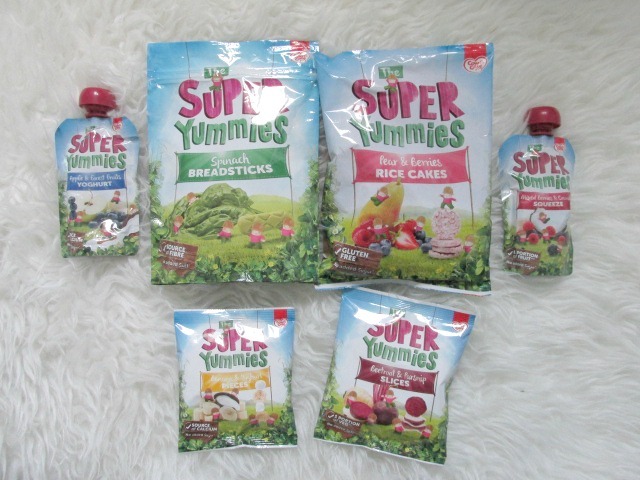 The Super Yummies range consists of breadsticks that are available in 2 flavours, spinach and tomato & herb, rice cakes, in pear & berries and apple & orange flavour, an apple & forest fruits yoghurt pouch and then strawberry, kiwi & banana squeeze and mixed berries & coconut squeeze pouches too. For children that are a 3 years and over there are the slices and pieces ranges of beetroot & parsnip slices, strawberry & yoghurt pieces and banana & yoghurt pieces. These are for older children as they are harder in texture than the rest of the range. Although I did try Blake on the banana and yoghurt pieces which he ate but wasn't too keen on, as he kept pulling a funny face. Before we were sent a selection of Super Yummies to try Blake had already tried both of the breadstick flavours and really likes them especially the spinach flavoured ones. I was happy to get the pack of spinach ones as they had sold out of them in our nearest supermarket. I was a bit spectial over if Blake would eat the Pear and Berries rice cakes we recieved as when we have given him rice cakes from a different brand in the past he wouldn't eat them and spit them out. I was happy to say that he has scoffed these ones so they are obviously a hit. Mixed Berries and coconut fruit pouches again he loved this one. Blake and that we will be certainly purchasing them again and highly recommend them. Have your little ones given any of these from the range a try? If not do you think you will give them a go? My son loves his rice cakes and used to love the pouches too. He's now three so has gone off them but snacks like that are so handy for popping in the changing bag when out and about. I've not heard of these before but they sound great! My little boy has a terrible sweet tooth and I try hard to find things that aren't crammed full of sugar for him to eat. Yes, it's so important to get healthy snacks for kids - glad Blake liked these. Look nice and convenient for taking out on the go as well. These look interesting. I need to try them for my daughters.